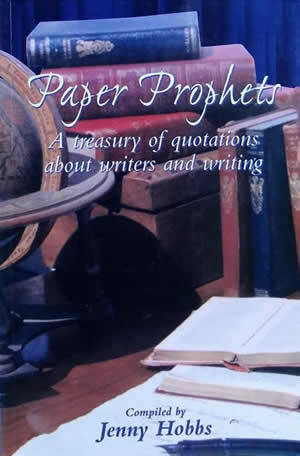 Paper Prophets: A Treasury of Quotations About Writers and Writing (Zebra Press, Johannesburg, 1998) is a collection of quotes about writers and writing. “Paper Prophets is a book of quotations for readers, writers and would-be writers…an entertaining romp in the pastures of the written word. Here are writers both literary and popular expounding on their views, disclosing their secrets, dropping hints, sounding warnings, taking digs at their peers and shouting the praises of their craft. Give Paper Prophets to someone who loves reading or aspires to write, or better still, take it home and hog it yourself. Who knows, you may end up following in the steps of Athol Fugard, who once said, `When I start writing, it’s like going on a journey, on a great adventure; I set sail again on the great mythic voyage of discovery’.